- Wow, what a turnaround... I had a real sinking feeling as this game went along. It just didn't seem like the Brewers could get anything going. And then Wood came in and the Brewers found their offense. This was a big-time, momentum-building win for Milwaukee and could be a defeat that sends the Cubs into a funk. - The Brewers have won four of six against the Cubs, all at Wrigley. That's a nice start to the season series against the baby bears and winning the series could go a long way towards winning the division, especially if it's as close at the wire this year as it was last year. - Braun is on fire. He had three RBI yesterday and adds three today along with a home run and the winning hit. His average is back up to .287. He has a big enough bat to carry the team, but hopefully Prince and others get hot soon too. - Gagne closed the door on the Cubs in the ninth after issuing a walk. He is tied for the NL lead in saves with nine. He has pitched five straight scoreless games. It hasn't been perfect as he's allowed at least one man on base in each of them, but he looks good. I still argue he didn't really look bad in any of his outings besides the first game against the Cubs. He's in a groove and will hopefully keep building on it. I'm confident in him. Are you? - I did not see the replay, but the play that Gallardo got hurt on sounded terrible. Uecker was commenting on how much this will hurt the Brewers, etc. Then Yo got up and started pitching again. Powell said after seeing the play, he thought Gallardo would be out for a year. It seems as though the Brewers dodged a huge bullet there. - Why do guys like Ryan Theriot always hit against the Brewers? He was three for four. Ryan Theriot. - Soriano returned to the Cubs line-up and went one for four and allowed Gabe Kapler's hit to fly over his head in the ninth. The hit helped continue the Brewers' game-winning rally. It was a ball a decent outfielder catches. Soriano's bat is big for the Cubs, but his below-average fielding, me-first attitude and completely miscast role as a leadoff hitter do not help the Cubs. Oh yeah, he's going to continue his stupid crow hop when he catches balls in the outfield too. - Speaking of outfielders fielding their position, Braun has looked good in his new position. He makes mistakes, but he has been far from a liability and made a great throw to his cut-off man, Counsell, today that ended up turning into an out at home plate. More HERE. - The Brewers are still trying to decide what to do with Turnbow. If you would have asked me yesterday (after a grueling double-digit loss in which Turnbow performed horribly), I would have said "Let's just cut ties with him. He's hopelessly lost." Now, I'm a bit more optimistic. If the Brewers put him through waivers now and he clears and agrees to a minor-league assignment (and why wouldn't he with a $3 million plus contract), he would have a chance to pitch more often in no-pressure AAA games. Maybe, just maybe, he could figure it out again. More HERE. BREAKING: Al's Ramblings reports a message board rumor saying Turnbow has been DFA'd with Dillon replacing him in the line-up. We'll watch for more on this. BREAKING BREAKING: This is looking more and more likely. Dillon apparently is joining the team tomorrow. 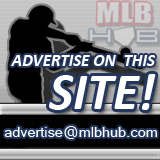 - Jeff Sackmann at HardBallTimes.com analyzes the Milwaukee 14-man pitching staff. R.I.P. Could it be down to 12 with a Turnbow-related move? - It's Villanueva vs. Oswalt tomorrow in Houston. - Mike Bauman says there's a lot to like about this Milwaukee team. - The Brewers extended two executives through 2012, Executive VP of Business Operations Rick Schlesinger and Executive VP of Finance and Administration Bob Quinn. More HERE. - A lot has gone wrong for the Brewers a month into the season and they still only sit a game and a game and a half respectively behind the Cubs and the Cardinals in the NL Central. You have to like where the Brewers are considering their struggles and the fact that the Cardinals will not pitch this well all year and the Cubs will not hit this well. More HERE. - Michael Hunt says it's debatable who has handled the early season better, but the last three-game series definitely goes to the Brewers over the Cubs. - Along the same lines, the Brewers recognize it's a long season (sports cliche warning...). - Powell recaps the Cubs series. - It's hard to tell (note sarcasm), but I think Brew Town Beat is down on Rickie Weeks. It's hard to be in love with what Rickie has done so far this season and in his career. He exudes potential, but it has not come together for him yet. - Another Mike Cameron returns story. - BBKTUTH! says it's time for The Muscle. - Viva Cerveceros relives a trip to Wrigley. - Bugs and Cranks takes some jabs at Cubs fans and Brewers fans. - Tony Gwynn Sr. says it's more nerve-wracking watching his son at the plate than it was for him going up in pressure spots. - Is the steroid era officially over?